I decided from the outset that I would interpret the Monochromatic theme by creating a piece using only one colour. For me the choice of colour – blue – was an obvious one, since this is my favourite colour and the one I like to incorporate most. However, I then found that I would need to think carefully about how to get enough interest into the piece when there was no possibility of using a contrasting colour to bring the piece to life. In that respect the theme was certainly a challenge that needed careful handling. My idea was then to use light and dark shades of my chosen colour and try to make the contrast in these add the desired level of interest. I decided to use a fairly simple design so that the colour itself did most of the ‘talking’ in this piece. I tried to incorporate further contrast by using a mixture of shiny and matte fabrics and threads, and regular and random stitching. The tree has its dark trunk and branches above ground and set against a pale ‘sky’ made by piecing scraps of fabric of light shades. The trunk and branches are made by plaiting and couching a number of strands of thread of different thicknesses. I have added abstract suggestions of foliage by couching rough circles of mohair wool strands. The darker below ground background is made by piecing strips of silk of darker shades, and the tree roots are couched threads. I have used hand stitched quilting throughout, using circular patterns in the sky and random seeding below ground. Finally I added random beading below ground to suggest water or nutrients in the earth which are feeding the tree. A delightful piece…humour and beauty in one. A great tree! Your hand-stitching is perfect for this piece. 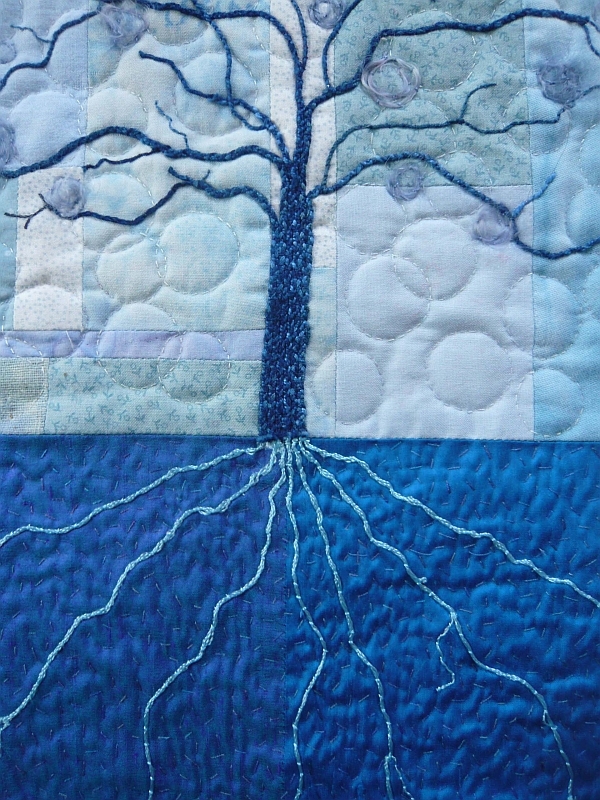 I love the use of hand stitching and the different textures that you have used to create the tree above and below ground. 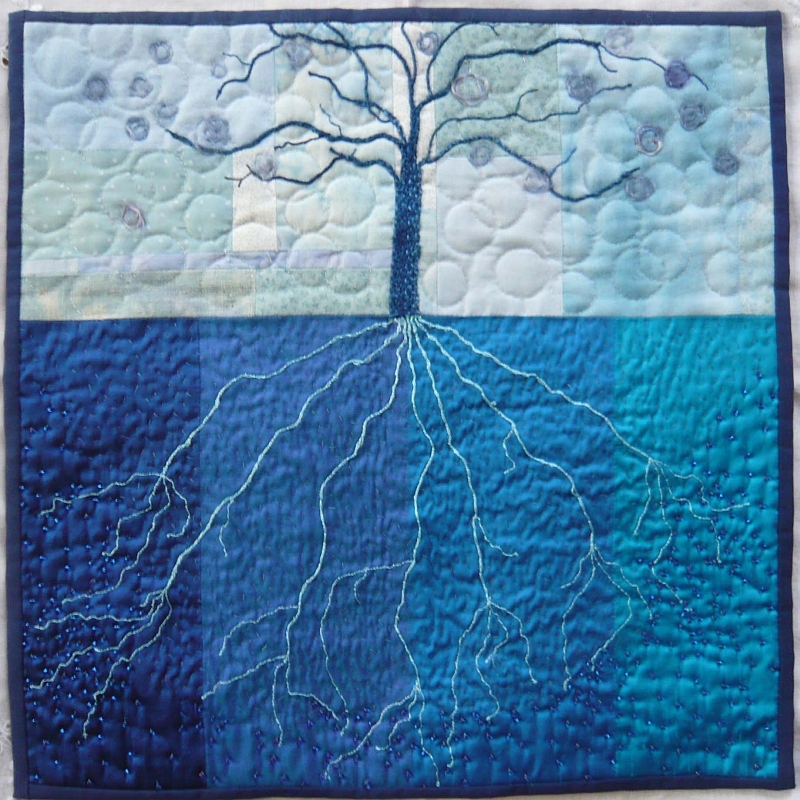 Beautiful piece and I love your quilting. You have honoured your favourite colour so effectively in this piece and your hand quilting is stunning. Beautiful contrast of the blue color. Very nice handquilting. I really like how you use all different threads.